↑　Click on the image to see PDF! 会長 An elected position filled at the beginning of each school year. Moderates meetings; ensures business of PTSA is carried out as outlined in constitution and as planned and approved by the PTSA committee. 副会長 The vice chairs assist the chair in fulfilling his or her duties and replace the chair in the event he or she is absent. 書記 Takes minutes at meetings and prepares these for circulation at each meeting. 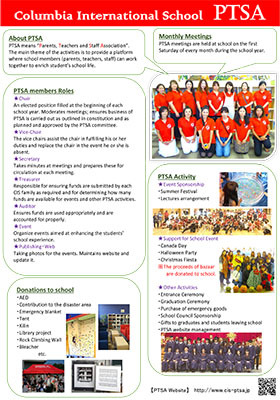 会計 Responsible for ensuring funds are submitted by each CIS family as required and for determining how many funds are available for events and other PTSA activities. 監査 Ensures funds are used appropriately and are accounted for properly. 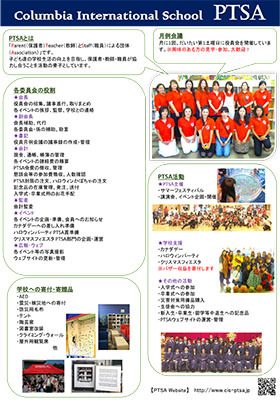 イベント Organize events aimed at enhancing the students’ school experience. 広報 Taking photos for the events. Maintains website and update it. ◎Please see below for more PTSA-Annual General Meeting information. We have a veryimportant request to ask you! Columbia International School started 27 years ago and CIS's Parents, Teachers & Staff Association(PTSA) started acting little after. The main theme of the activities is to provide a platform where school members (parents, teachers, staff) can work together to enrich student’s school life. Our PTSA, since they started, the members always volunteered themselves to join. They were very happy to do their work. We had many staff and they are acting positively. But recently the number of the PTSA staff is decreasing. It is becoming very hard to keep up the PTSA activity. We know you are busy enough. If you think you are not able to attend monthly meeting please talk to us about it. If you have some ideas for your children and try to make it happen with PTSA, we are welcome. The PTSA membership fee is JPY 12,000 per household for a school year. We use it for including publishing the PTSA website, helping with school events, making presentations to new and graduating students, helping acquire school equipment, and holding parties for CIS parents, teachers and staff members. And then, PTSA has taken out both Acccident Insurance and Liability Insurance which covers accidental damage that occurs during the PTSA hosted/co-hosted event. Please note that payment for those insurance cost are covered by PTSA membership fee. We are grateful for your understanding and cooperation! Copyright © 2013-2018　CIS-PTSA All rights reserved.